Including a child with special needs can present challenges inside a church’s programming. However, by planning ahead and incorporating easy changes into the existing curriculum’s lesson plan, the classroom setting can better include the child with cognitive or physical challenges. The key to making effective adaptations is in understanding the participating students’ strengths and weaknesses. Knowing the children’s ability levels is the starting point for making any curriculum changes. This is a guest post submitted by Amy Fenton Lee. Read more about this important topic at their blog titled The Inclusive Church. 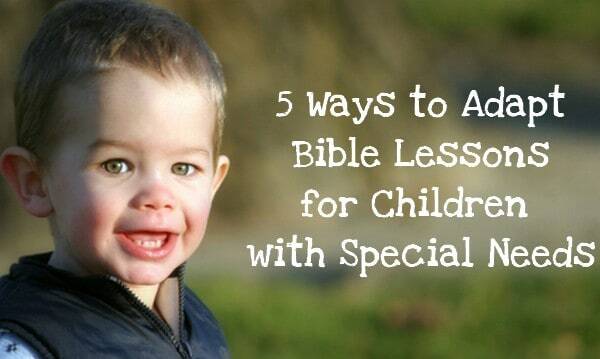 Their articles will help your church be more welcoming to children with autism, ADHD, children with Down Syndrome, and other learning disabilities. She has some great ideas for special needs curriculum and resources. Simply adjusting the instructions or parameters of an activity may make a suggested project feasible for an individual with cognitive or physical challenges. Taking the time to review the lesson plans and then make the needed adjustments is the biggest requirement. For special needs designated classrooms, the planning can apply to the children more corporately, although every child with special needs has unique attributes related to their ability or disability. For typical environments including one or two children with special needs, coaching the volunteer teachers how to spot and make potential curriculum adjustments is important. For many activities the same materials can be used, so long as the activity’s objective or required participation is altered to accommodate a specific child’s ability level. In some cases, pre-cutting or partially assembling a craft project may be the only adjustment necessary! When plans include activities that will predictably fail to engage a child with special needs or limitations, then pull from another resource or provide a different activity for that child. In some cases the entire class may benefit from the substitution or change. Usually, there is no need to completely abandon the starting point and outline that existing curriculum may provide. Instead, invite a special education teacher or pediatric therapist (occupational, physical or speech) to take a quick glance at the church curriculum. Very often, they can identify activities in need of modification, substitution and enhancement. And they can offer incredibly simple suggestions that make the existing material come alive and relate to children with special needs or differing learning styles. I have a quick question. My church is wanting to start a special needs ministry. My question is does the teacher need to be a licensed teacher in order to teach this class in church? Tony Kummer (Editor) reviewed & updated this page on : August 23, 2012 at 8:52 am. All our content is peer reviewed by our readers, simply leave a comment on any post suggest an update.